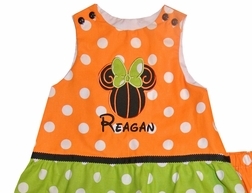 An adorable twist to an outfit for Thanksgiving and Halloween is this Minnie Mouse Pumpkin dress/outfit! 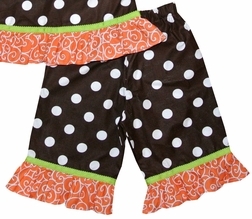 We take a brown with white dots fabric embellished with orange and white swirls ruffles OR orange with white dots fabric with lime with white dots ruffles and make a dress or swing top and trousers. 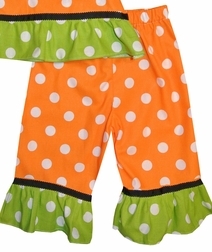 The top and trousers are embellish with either lime or black scalloped edge small ribbon about the ruffles. 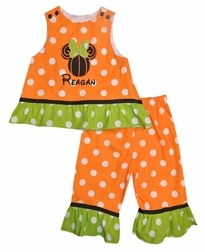 The front of the dress/top is appliqued with Minnie swirly pumpkin head wearing a lime green dots bow. The pumpkin head is black for the orange color scheme and orange with white swirls for the brown color scheme.